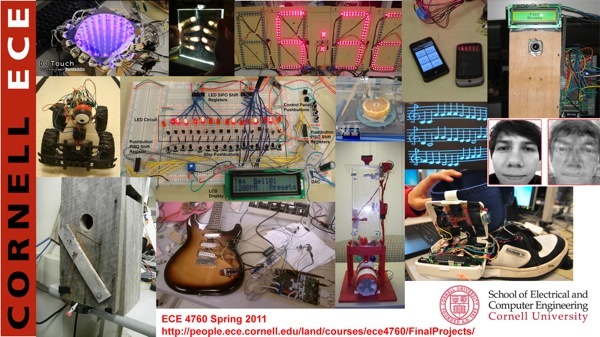 Designing with Microcontrollers – Final Projects @ Cornell « Adafruit Industries – Makers, hackers, artists, designers and engineers! Students in ECE 4760 at Cornell University were given the responsibility of choosing,designing and building a project using Atmel Mega644 microcontrollers. Projects this year include a multitouch interface, face recognition system, and an automated rock band vocal player, as well as musical instruments and scientific devices. During the last 5 weeks of the semester in ECE 4760,Microcontroller Design, students have to combine sensors, actuators, microcontrollers, and mathematical techniques to build something. All projects show a great deal of originality and work. There are over 380 projects on the page. This year the coding was done using WINAVR and AVRstudio.